Jeremi Davidson began freelance writing in 2005. Davidson enjoys writing about sports and personal fitness, contributing to a number of different health and lifestyle websites. He holds a Bachelor of Arts in English from Thompson Rivers University. The muscles that you use during a freestyle swim are different from the muscles used with other swimming strokes. Since your arms reach forward throughout the freestyle stroke, you rely on your core muscles to stabilize yourself as you propel yourself through the water with your arms and legs. Strengthening your freestyle muscles away from the pool can make you a stronger, faster swimmer. The most visible portion of the freestyle stroke is the arm motion. During this motion, you bring one arm over your head and put it into the water. At the same time, your other arm propels you underneath your body. Many different parts of your arm work at once in the stroke. Your hand and forearm muscles go into the water and become the actual vessel that propels you. Your shoulders, biceps and triceps work together to move your hands and forearms by forcing them through the water. As you swim, the front part of your body's trunk helps with most of the movements. Your pectoral muscles, side muscles and abdominal muscles all work to pull your arms through the water. They also work during the recovery phase of the stroke, as you reach your front arm out as far as possible. 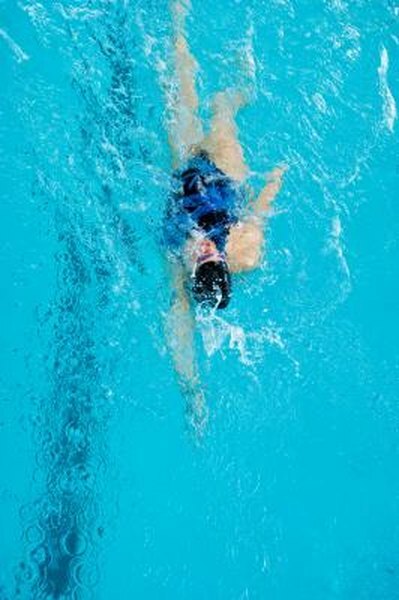 A good freestyle stroke includes a hip roll, which involves your obliques and abdominal muscles. Your back muscles, traps, spinal cord supports and rhomboid muscles all work to stabilize the body throughout the swimming stroke. Without these stabilizing muscles, you could not propel yourself through the water with your arms. As you swim, gravity pushes your legs farther into the water, while your body's buoyancy pushes your chest out of the water. This slows you down in the pool, so using your back to keep yourself horizontal allows you to maximize your speed. You also use these muscles as you roll your hips through the stroke while switching arms. A good hip roll helps you to breathe, and the muscles of your upper back help you to get your head above water far enough to take a breath. Kicking helps greatly during the freestyle stroke, since it takes some of the strain away from the rest of your body. Your quads, hamstrings, glutes, calves, shins and foot muscles all work hard during the stroke and propel your body through the water. The kicking motion comes in two stages, as you kick upward and downward, with each stage using a different set of muscles.